Read our Volunteer Manual for more information and fill out this form or call 651-647-4315 to apply. Contact us at info@mnjewishtheatre.org org for any additional questions or if you prefer to apply over the phone. Thanks in advance! 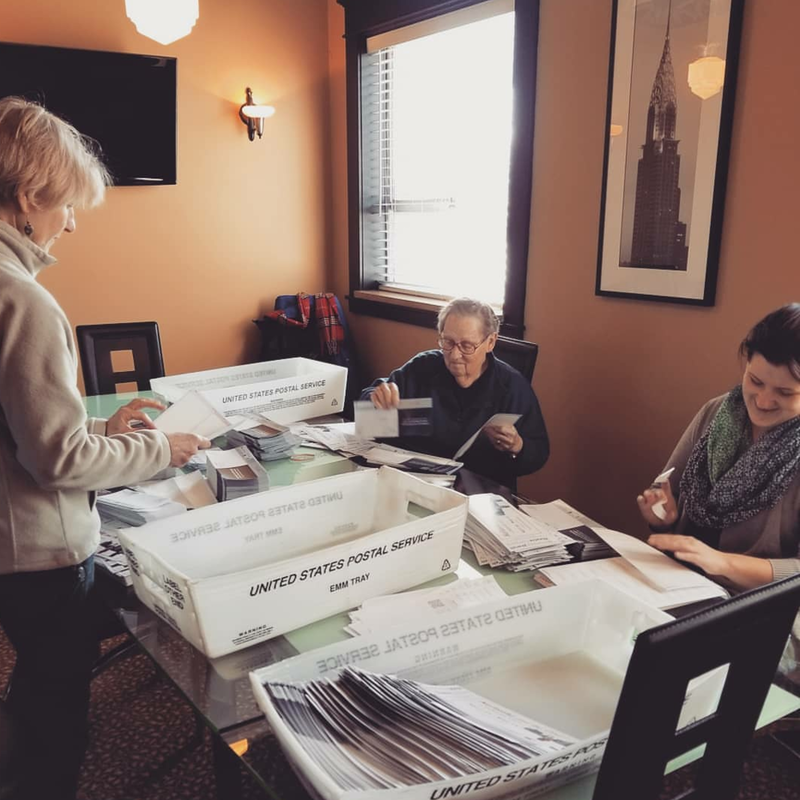 Volunteers help with our office mailing (2018). Our ushers are the friendly faces who greet patrons at the theater. While experience is not necessary, it is always appreciated. Before your first shift you will be trained and given a tour to allow you to best serve the patrons coming to the show. Scheduling is on a first come, first serve basis via email. Ushers are required to stay for the whole performance giving you a chance to see all of what MJTC has to offer. COMMITMENT: Volunteer ushering requires you to be on your feet and able to move up and down stairs. Some light lifting may be required. Volunteer Usher hours vary. Time commitment is usually 3 hrs per shift. SCHEDULING & ATTENDANCE POLICY: We understand conflicts and emergencies arise, however, 2 no-shows to scheduled usher shifts could result in removal from the volunteer program. We rely on our ushers to be present and up to the task at hand for entire shift providing excellent customer service to our patrons. Office volunteers help with MJTC’s direct mailings. MJTC does approximately six (6) mailings a year. Office volunteer work includes putting labels on mail piece or stuffing and sealing envelopes. For every 2 hours you help in the office you will receive 1 complimentary ticket to a show in the current season. This is a wonderful way to help MJTC and see all the productions. Office volunteer hours are typically M-F 9-4.